Lobbies are a facility’s initial destination, the point of departure, the information center, and a security checkpoint. 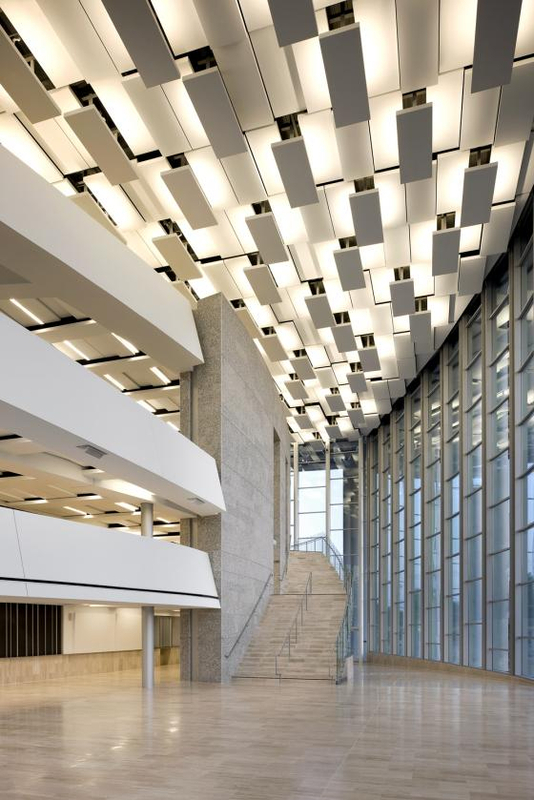 It can be difficult to impose blanket acoustical criteria, because lobbies take an infinite number of forms, and must respond to building occupancy, fire safety, pedestrian flow, plus cultural tastes and architectural aesthetics. The primary functions include services for information, ticketing, and security, which necessitate speech intelligibility. This in turn suggests concentrating sound-absorptive treatments near ticketing and information booths where speech intelligibility is important, as well as providing shelter for task-oriented areas. Great lobbies serve secondary functions, such as providing daylighting through large areas of glass, but glass is sound-reflective. Noise, speech, or music generated in the lobby should not transmit to other spaces. Appropriate sound isolation can be achieved through careful placement of doors, vestibules, hallways, and partitions. HVAC noise should be relatively quiet. -Ceiling and corridors are highly diffusive, which scatter sound and soften individual sound reflections. – Balconies are large protruding elements that scatter sound. -Areas under the balconies and stairs offer noise shielding for patrons to comfortably purchase beverages and tickets, check coats, and engage with ushers. This lobby successfully hosts pre-function events such as small choral groups on the main stairwell, bustling cocktail hours, and many post-function events such as autographs, fund raising, and cabaret. Figure 2 shows a five-story lobby in a large courthouse facility. 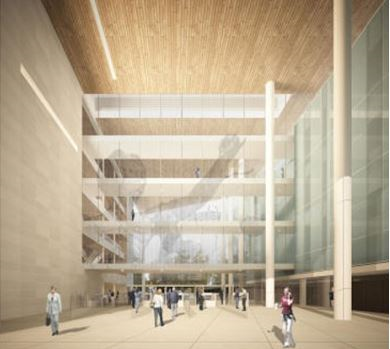 The lobby is the main entrance for the facility, and connects the courthouse wing to the administrative wing via a series of stacked bridges. The design called for walls to be glass and brick, with a hard floor and wood ceiling. The resultant reverberation (time for sounds to decay to inaudibility) would be comparable to a cavernous cathedral and would impede clear communication. Reverberation was reduced by providing ½” separations between individual wood planks at the ceiling, which allows sound to be absorbed in insulation above. The reverberation is still very long (about 2-1/2 seconds), but now people can communicate easily within about 6 feet of each other. Beyond that distance, speech is garbled, which effectively promotes privacy from most other occupants. The buildup of sound from various occupant activities would be too noisy for the security guards, so security personnel were relocated under the lowest bridge, shielding them from the general lobby noise and reverberation. A successful design is sensitive to the goals of the facility, manages reverberation, collects activities into shielded areas, and prevents distracting noise from transmitting to noise-sensitive spaces. Careful balancing of surface shaping, finish treatments, and sound isolation can deliver a great lobby.